Down deep off the south slope of São Jorge Island in the Azores, west of Portugal in the North Atlantic Ocean, a fearsome-looking fish and her parasitically attached mate drift almost helplessly, salvaging precious energy in their dark, food-scarce environment. The pair, a species never before seen alive by humans, was recorded recently on camera by researchers Kirsten and Joachim Jakobsen aboard the LULA1000, a submersible operated by the marine science-focused Rebikoff-Niggeler Foundation. For some 25 minutes, the female — a kind of anglerfish known as the Fanfin Seadevil — was observed to float slowly and gracefully, rolling in the current, head down and head up, through the pitch-black water at a depth of about 800 meters (2,600 feet). She swept her long whisker-like fin-rays back and forth, with pinpoints of light emanating at intervals along the length of each ray — the soft, spine-like structure that supports the fins. Hard to see at first glance was a tiny male, hanging from her belly. It is a mesmerizing scene for the average viewer, but for Ted Pietsch, a University of Washington professor emeritus of aquatic and fishery sciences and curator emeritus of fishes at the Burke Museum of Natural History and Culture, the video footage is downright amazing. Deep-sea anglerfishes, including the Fanfin Seadevil, scientifically known as Caulophryne jordani, are found in all oceans around the world, yet the roughly 160 known species are extremely rare. For example, only 14 females of the anglerfish in this video exist in jars of alcohol in natural history collections around the world. 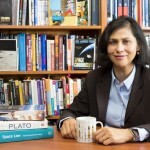 Males of the same species have never before been observed. 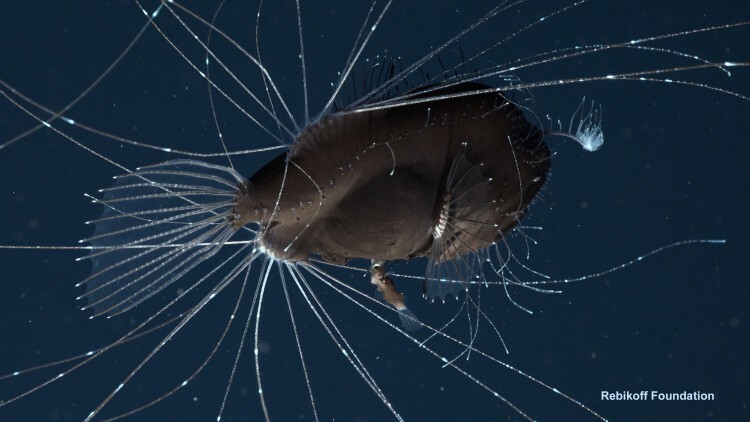 Despite substantial growth in recent years of deep-water exploration, the foundation’s spectacular video observations mark only the third time anglerfish behavior has ever been recorded in deep water, Pietsch said. 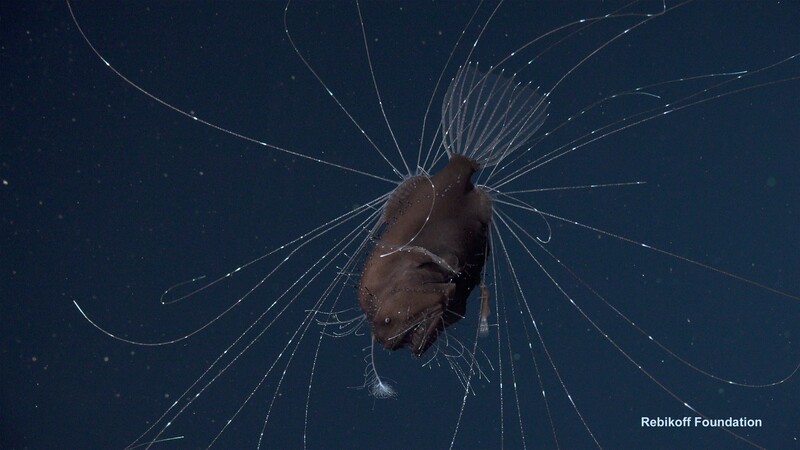 Deep-sea anglerfishes lure their prey in the inky-black ocean darkness at depths between 300 and 5,000 meters (980 and 16,400 feet) using a bioluminescent fishing apparatus placed on the tip of the snout — hence the “angler” in their common name. Their enormous, toothy mouth and expandable stomach enable them to capture and devour prey larger than themselves in a single instantaneous gulp. Deep-sea anglerfish males are a fraction of the size of the females — in the most extreme cases, females may be more than 60 times the length and about a half-a-million times as heavy as the males. The males don’t have a luring apparatus; instead, most have large, well-developed eyes and huge nostrils, which help them home in on a species-specific chemical attractant emitted by the females. Once a male finds a female, a seemingly impossible task in the vast open space of the deep sea, he bites onto her body, the tissues and circulatory systems of the two fuse, and he is fed by nutrients received through her blood. The male becomes a “sexual parasite,” hanging on for the rest of his life and unable to free himself, fertilizing the eggs produced by the female. The male completely loses his individuality and the couple becomes a single functioning organism. Video footage of this kind allows us to see these animals behaving in the wild, something otherwise impossible, Pietsch said. Like most deep-dwelling organisms, anglerfishes can’t live under laboratory conditions. Most are already dead by the time they are brought to the ocean’s surface, not only because of the pressure change, but also the great increase in temperature compared to their deep-water environment. “I have spent hundreds of hours staring into deep waters, but this is one of the most amazing video footage I have seen to date. It brilliantly shows the otherness of deep-sea life, and how important it is to observe these animals in their own realm, to understand their behavior and adaptation,” said Antje Boetius, a biological oceanographer at the Alfred Wegener Institute in Germany, who recently completed her 49th deep-sea expedition. The Jakobsen video also shows body structures and behaviors never before recorded for any fish. For example, almost all fish fin-rays are connected by membranes that cause the fin to move as a single unit, but those of the Fanfin Seadevil move independently — each is equipped with its own set of muscles that control movement and a nerve that runs the full length. “One can’t help but think these fin-rays form a network of sensory antennae, a kind of sphere of tactility around the fish — akin to cat whiskers — that functions to monitor the close presence of predators or prey,” Pietsch said. And what about those pinpoints of light, scattered along the length of the fin-rays, also something never seen before in any fish? They are most likely the result of bioluminescence. Pietsch speculates that this “light-show” may have a number of different functions. It may attract prey, or alternatively give predators the impression of a much larger organism, too formidable to attack and too big to swallow. Or maybe the fish is mimicking a jellyfish, with its stinging tentacles, and further avoiding being eaten. 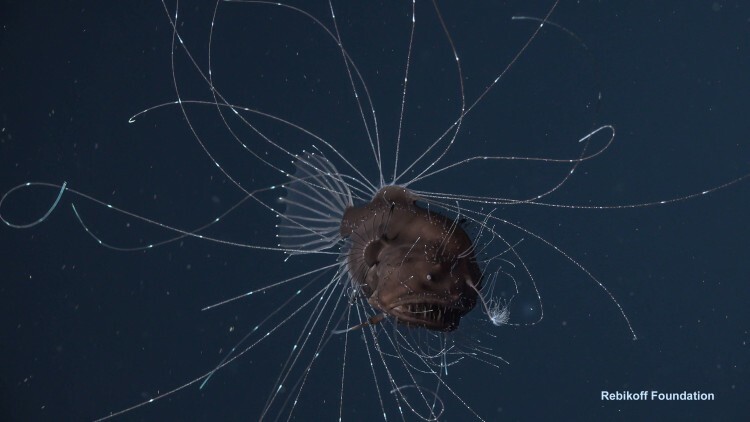 Observations like this video by the Rebikoff-Niggeler Foundation are the only way scientists can better understand how deep-sea animals live and interact with other organisms around them. The Rebikoff-Niggeler Foundation is a non-profit organization for marine science with the purpose of fostering research and documentation of deep-sea environments. One of the foundation’s primary goals is to observe deep-water animals in their natural environment using manned submersibles. For more information on anglerfishes, contact Pietsch at twp@uw.edu. Contact the Rebikoff-Niggeler Foundation at info@rebikoff.org or +351 919858539 (Portugal).